Promoters of the Lancashire, Derbyshire & East Coast Railway (LD&ECR) envisaged a coast-to-coast link between Warrington on the Manchester Ship Canal and a new Lincolnshire port at Sutton-on-Sea. In the event the route was restricted to interconnection between Chesterfield and Lincoln, and a spur line from Langwith Junction to Beighton to provide a link with Sheffield. After only a decade of operational life under its own impressive armorial device, the LD&ECR was taken over by the Great Central Railway (GCR) in 1907. For those interested in reading a detailed account of the formation of the company together with descriptions of the route, locomotives, rolling stock and passenger services then ‘The Lancashire, Derbyshire & East Coast Railway’ by J. Cupit & W. Taylor (published 1966, reprinted 1984 and 1988, by The Oakwood Press) is highly recommended. Captured around 1900, the distant gloom of Bolsover Tunnel. The same view today, with the western entrance and its approach cutting consumed by infill. The LD&ECR had the dual distinction of being the largest railway scheme ever to be approved by Parliament at a single sitting and yet the least known of Britain’s minor lines. It was William Arkwright, a descendant of the renowned Sir Richard Arkwright of Cromford Mill, who, having inherited the Sutton Scarsdale estate, saw an independent railway interconnecting the west and east coasts as a means of gaining access to a wider market for the coal, which lay not only beneath his land but the holdings of his illustrious neighbours, which included the Dukes of Newcastle, Devonshire, Portland and Rutland, Earl Manvers and the Sitwells. His original intention was to build lines for mineral traffic only but, in 1887, the prospectus of the Chesterfield and Lincoln Direct Railway was published proposing a route across the Sutton Scarsdale estates, which linked with the Midland Railway’s network at each end. The promoters, acting independently of Arkwright, failed to stimulate much local interest but their chosen route seems to have found favour with him since it was replicated in the LD&ECR scheme. The Bill for this scheme was before Parliament in 1891, receiving royal assent in August of that year. Arkwright had Emerson Muschamp Bainbridge advising the company. Bainbridge was Managing Director of the Bolsover Colliery Company, principal owner of the Nunnery Collieries at Sheffield and MP for the Gainsborough Division. He became chairman of the LD&ECR. Once the first 56 miles of the proposed line from the west had been discarded, Chesterfield’s claim to be the location of its headquarters could no longer be contested and site works began in 1892. Although in close proximity to New Square, that part of the town’s market area, which lay on the west side of the Market Hall, the Market Place Station was in fact on West Bars next to a newly built Portland Hotel. It was constructed to incorporate the company’s offices on its upper floors and provision was made for extensive goods handling facilities. The track from the Market Place station edged around the town centre’s southern boundary on an embankment and traversed the River Rother, the Midland Railway’s main line, the GCR’s Chesterfield Loop and the main Derby Road on a 700-foot viaduct. Thereafter, a 1 in 100 incline over two miles took the line to a tunnel at Bolehill, some 630 yards due south of the main road through Duckmanton. After 501 yards the line emerged into a cutting, crossing under the GCR’s Sheffield-Annesley line and through Arkwright Town Station, which was located 3¼ miles from the terminus and, but for an objection by the Staveley Company, would have been more appropriately named Duckmanton Station. Beyond Arkwright Town Station, the line passed under Longcourse Lane at a point 450 yards south of its ‘T’ junction with Long Duckmanton and, curving gently to the south east, assumed a south easterly course towards Bolsover Station. A diagram of the gradients encountered by the LD&ECR between Chesterfield and Scarcliffe. The Duckmanton Tunnel at a length of 501 yards was dwarfed by the Bolsover Tunnel, which extended in virtually a straight line for a distance of 2,624 yards. 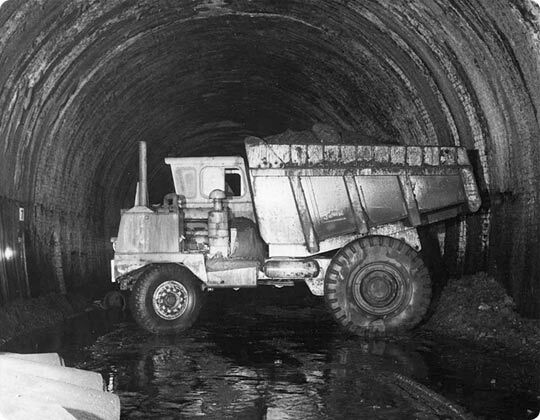 The Duckmanton Tunnel was itself infilled during the early 1970s. A short distance to the east of the Duckmanton Tunnel, a connection to the GCR main line was installed in 1907 and, one mile down the line, the LD&ECR created Markham Junction from which Bolsover and Markham Colliery No.1 were served by a branch line. The River Doe Lea flowed under the line less than 600 yards to the east and the LD&ECR erected a viaduct over the Midland Railway’s Doe Lea Branch line 600 yards west of Bolsover Station. Cupit and Taylor noted that despite the robust design of the viaduct it was damaged by subsidence; cracks appeared and the alignment of the rails was affected to the extent that the smooth running of the rolling stock was compromised and bricks were frequently dislodged from the arches. The town of Bolsover overlooks the LD&ECR’s route from a high vantage point some distance away and Bolsover Station was clearly a misnomer since it was located off Castle Lane, Carr Vale. 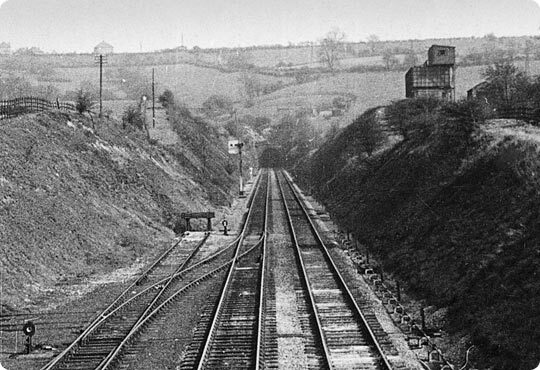 The western access to the Bolsover Tunnel was approximately 700 yards east of the station whilst its eastern portal stood on the southern edge of Scarcliffe Village. From that point the line continued on a serpentine course to Langwith Junction. Passenger services between Chesterfield and Langwith Junction were discontinued early in December 1951 due to problems experienced with the Bolsover Tunnel. It had been designed as a semi-circular arch with straight walls 20' 9" high at the centre and 25' 9" wide and was excavated by boring through strata of Permian Limestone and coal measures. At an early stage of construction, work was hindered by the ingress of water and deposits of shale were encountered in the rock. Once in service, the tunnel continued to be plagued by dampness and it became a maintenance liability. Later in its operational life it was reported that the brick lining fractured in parts making railwaymen reluctant to pass through. Decommissioning was not, in itself, a final solution since the presence of such an extensive subterranean void presented a serious liability to both the National Coal Board (NCB) and British Railways (BR). 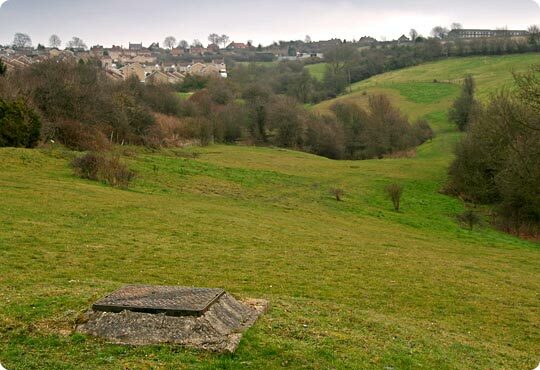 This part of Derbyshire had been intensively mined over a long period and the Board was well aware that future exploitation of less accessible reserves in the vicinity of the tunnel was likely to precipitate serious subsidence. Indeed, a letter dated 16th January 1934 and sent to the Works Committee reads: "Bolsover Tunnel, under which it has been agreed to allow the Waterloo [coal] Seam to be worked, continues to be affected by subsidence due to these workings and the necessary steps are being taken, from time to time as required, for its protection." Ultimately, the Bolsover Tunnel was doomed. The SL Dumptruck manoeuvring to approach the tipping area, within Bolsover Tunnel. The Aveling-Barford News (Vol.5 No.12, April 1967), house journal of the Aveling-Barford Group, featured an account of the measures taken to comply with an agreement reached between the NCB and BR that the Bolsover Tunnel should be infilled. It was estimated that this would require 150,000 cubic yards of ‘run-of-mine dirt’ to be hauled by road from Bolsover Colliery to a stockpile about 900 yards from the tunnel entrance. The NCB’s Civil Engineering Department was authorised to undertake the task and work started on 10th October 1966 with two Aveling–Barford SL.300 Dumptrucks. Initially the laden haul was in excess of 2,400 yards and heavy rainfall had softened the ground on the approach to the entrance, although generally conditions varied from extremely wet to reasonably dry. Each vehicle delivered 12 tons up a slight adverse gradient but, once the tunnel was entered, total darkness prevailed and the drivers were entirely reliant on their own lights. The cumulative effect of locomotive smoke stacks over the years had endowed the brick lining with a generous coating of soot and even the less affected walls had no reflective properties. At various points in the tunnel, cascades of water seeped through the roof, ensuring that the unmetalled track bed remained immersed to depths ranging from one inch to two feet. A load of ‘run-of-mine dirt’ being tipped prior to the arrival of the excavator. Note the props in the centre of the tunnel. On 8 March 1897, the tunnel was illuminated by flares, so that it could be seen by guests on a special train from Chesterfield to Edwinstowe marking the official full opening of the LD&ECR. 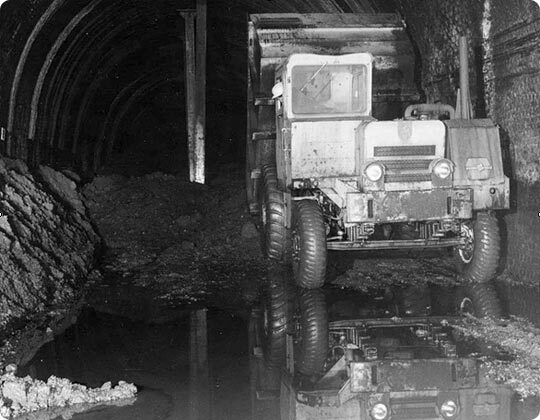 At the initial stages of the infill project, the dumptrucks were driven into the tunnel in the forward position to within about 50 yards of the fill area. They were then turned round, reversed up to the fill point, tipped and driven out, a routine that achieved a saving of three minutes on the cycle. With a turning circle of only 23' 6" it was possible to turn the SLs around with a minimum of shunting although, at the centre of the turn, the clearance at either end of the dumptruck was only one yard. When the tunnel had been significantly shortened, it was anticipated that further economies would be achieved by using two-way steering and controls on the SLs. The second SL followed the first after an interval of two minutes. Both drove on the right but on approaching the fill area the second dumptruck moved to the left side and waited for the first to tip and drive away. The second turned and reversed to the fill area, tipped and followed the first out of the tunnel, both using the same side as that used for the inward journey. A combination of skilful driving and strict observation of a mutually agreed safety code enabled the dumptruck operators to complete a fill cycle in 25 minutes. Each day 17 trips were made, which resulted in the delivery of more than 400 tons of fill. Whilst the dumptrucks were en route for another load, a tracked bucket excavator compacted the fill material into position, filling all but the top three feet of tunnel head, which was left open to facilitate ventilation. 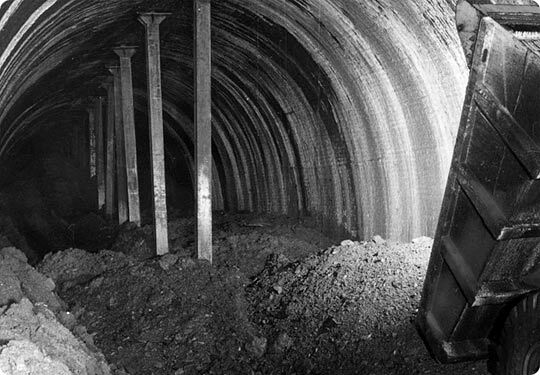 A large extractor fan, installed at the partially sealed Scarcliffe end, withdrew air through the tunnel at two feet per second. Air samples were taken periodically and, despite the use of diesel engines within a confined space, the air quality remained within prescribed limits. Reflections in a tunnel. The SL Dumptruck has completed tipping and is in position to leave for another load. It would be a gross understatement to describe working conditions within the Bolsover Tunnel as challenging. The inordinate length, restricted manoeuvring space, lack of visibility and ever-present water created a threatening and potentially dangerous working environment, which demanded a skilled workforce. Aveling Barford News noted that surface conditions were so unpredictable due to flooding that there were times when the rear axle casings of the SLs ‘rubbed on the ground’. The article also mentioned that such was the intensity of the darkness that it was only the bands of ‘Scotch tape’ on the white safety helmets worn in the tunnel, which enabled the operatives to identify one another. It was against this background that British Rail brought the infilling works to a premature end, fearful of the increasing danger to personnel. Bolsover Tunnel's west portal captured shortly before the backfilling operation started. The portal and approach cutting are now buried. Over the past 40 years, the need for more comprehensive health and safety legislation has been recognised to the extent that little is left to the discretion of site managers. One can only speculate as to its impact on a modern Bolsover Tunnel project. It can be assumed, however, that something more sophisticated than Scotch tape would have been required as an aid to visibility.